The game was played beneath the lights, though it had all the hallmarks of the trashiest daytime television. The proceedings were complete with clashing personalities, spectacular incompetence, the promise of conflict, and then pain. "Today was fun," said a hobbled David Wright, who faces an uncertain immediate future, but was still able to appreciate the absurdity of the Mets' 6-5 win Tuesday night over the Phillies. 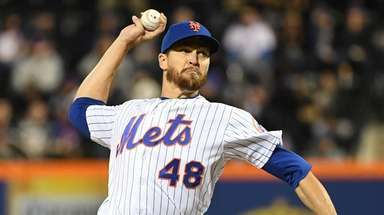 In his first start at Citi Field since Tommy John surgery, Matt Harvey electrified the crowd when he plunked Mets villain Chase Utley on the back with a fastball. Meanwhile, the umpires made a mess of the video review system, and irate manager Terry Collins was ejected for arguing a phantom catcher's interference call. But the eventful night was met with a sobering development in the eighth. That's when Wright broke to steal second base before feeling a pull in his right hamstring. He tried sticking it out. But after taking a few secondary leads, he asked out of the game. Now, Wright faces his second major hamstring injury. 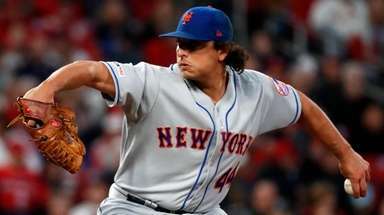 And the Mets may soon be forced to deal with another body blow early in a season filled with aspirations and expectations. "I just know that guy," Collins said. "If it wasn't major, David Wright wouldn't open his mouth." By the end, backup catcher Anthony Recker was filling in at third base for the first time in his career, in yet another bizarre twist to the night. An MRI is scheduled for Wednesday. Though Wright has yet to be placed on the disabled list, the Mets already have summoned utilityman Eric Campbell from Triple-A Las Vegas. "They're not going to let down now," Collins said. "We've got some issues we've got to deal with for sure, but we'll just have to pick it up and move forward." Had it not been for Wright's injury, the Mets could have come away from Citi Field feeling good about a hard-earned, dramatic and bizarre victory. 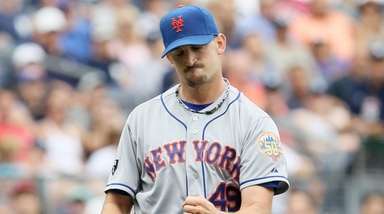 "I think that might have been the weirdest game I've been a part of in, maybe ever," said Harvey, who allowed three runs and struck out eight over six innings. It was a minor miracle that Harvey made it that far considering the awkward delays he endured. 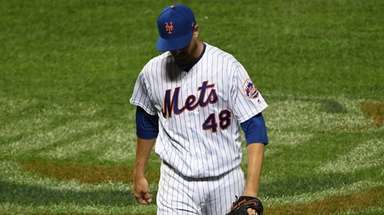 The Mets' slumbering offense broke out for three runs in the second, thanks to Lucas Duda's three-run double. In the third, plate umpire Aflonso Marquez ruled that Freddy Galvis had been hit on the arm with a pitch though replays showed that the baseball never changed path. From the dugout, Collins was late to signal for a challenge, so he implored the umpires to look at the call on their own accord. Phillies manager Ryne Sandberg launched his own protest. The delay lasted long enough that Harvey was permitted warm-up pitches. The fifth featured Harvey drilling Utley between the 2 and 6 on the back of his uniform, this after Phillies starter David Buchanan plunked two Mets batters, including Michael Cuddyer, who had to leave the game with a bruised hand. Harvey said he was " a little overamped." Utley finished with two homers and three RBIs. Harvey sat through another stoppage, this time after Collins argued what appeared to be a phantom catcher's interference call. As Collins turned red, waving his hands at Marquez, the crowd egged him on with chants of "TER-RY! TER-RY!" Later, Daniel Murphy took advantage of the kinder, cozier Citi Field, when his solo shot in the seventh sailed over the shortened fence in right-center. But the joy wouldn't last. 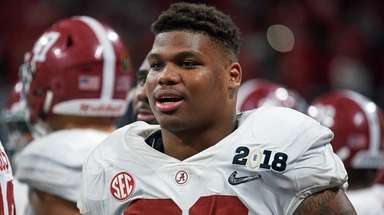 "The big picture is we're eight games into the season and hopefully for me the worst-case scenario is you miss two weeks," said Wright, who played through a hamstring injury in 2013. "Rather than do something stupid, play through it, and have to miss two months."